Okay, now that the count-down clock has counted down on CNN, where was the smoking gun that the Comey hearing was supposed to provide? Where was the fireworks? The there – there? WTH was all the hype about? Cartoonists are having a field day with the fizzle. The looniest of the left are still trying hard but the smart ones have kept quiet lest they look as loony as the obsessional nuts. Comey was supposed to say something that would cause the impeachment of Donald Trump. 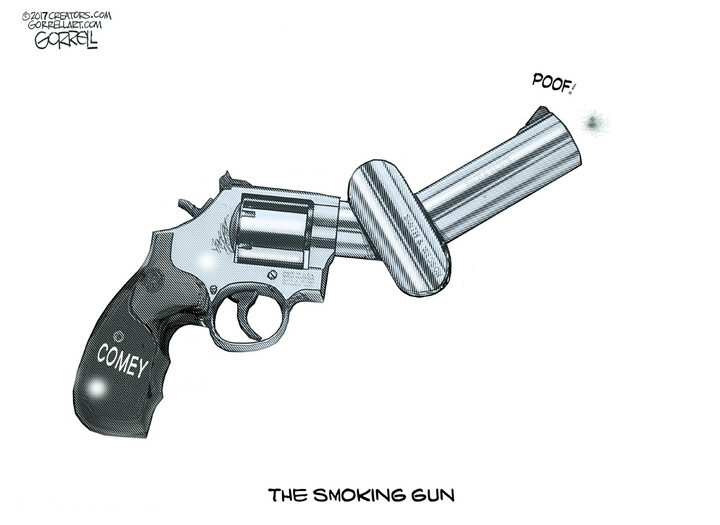 He had the smoking gun and was going to use it. Bang! Except he didn’t and he didn’t. Oh the angst of it all. There are Trump haters, both left and right that are still promising that there is more here than meets the eye. Just wait until Mueller gets going. So the Comey show will change it’s name to the Mueller show now? Good grief it must be tiring to hate so much that you turn yourself into a pretzel to keep your hate happy with dreams of impeachment. The streets in Washington, D.C., were abuzz with excitement in the hours before former FBI Director James Comey walked into the Senate Intelligence Committee’s hearing room at 10 a.m. on Thursday. Even though it was way too early for a drink — and a school day to boot — young politicos across the city lined up to pack into trendy nightspots to knock back a few and enjoy The Jim Comey Show. Former FBI Director James Comey’s “Testimony of the Century” turned out to be not just disappointing to those who have been calling for Donald Trump’s impeachment since before he was even inaugurated, but devastating to some of the key anti-Trump narratives, most importantly the Russia collusion conspiracy theory. The person who came out looking the worst from the hours-long testimony wasn’t Trump or even the FBI director he fired, but a Democrat darling: Barack Obama’s Attorney General Loretta Lynch. Another major casualty of Comey’s testimony was the establishment media, in particular, the New York Times. 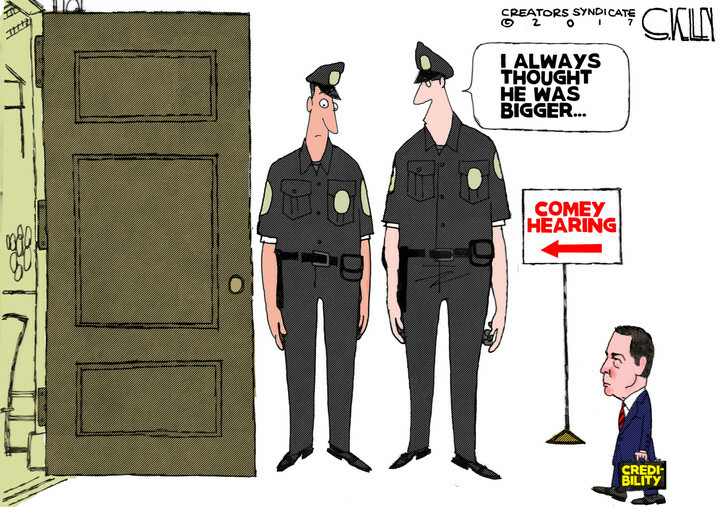 Comey actually is 6’8″ tall. And yet he somehow looked small yesterday. Much of that wasn’t his fault but the fault of the media that turned his testimony at this hearing into something it was not. A giant gotcha that didn’t get much of anything. Fizzle’s R Us courtesy of CNN, MSNBC and the NYT just to mention a few. Was there testimony that Trump acted inappropriately? Yes. No surprise there since the man seems incapable of acting appropriately most of the time. But this was supposed to bury him – impeach him – prove him a criminal. It. Did. Not. However it did shine a very bright light on some Obama people that was less than good and that the Dems didn’t want to see the light of day. In the end it seems it was mostly much ado about nothing. The New York Daily News has a screaming headline that Trump lied. Okay, tell me something I don’t know. Trump is a liar is hardly big news. Or new news. 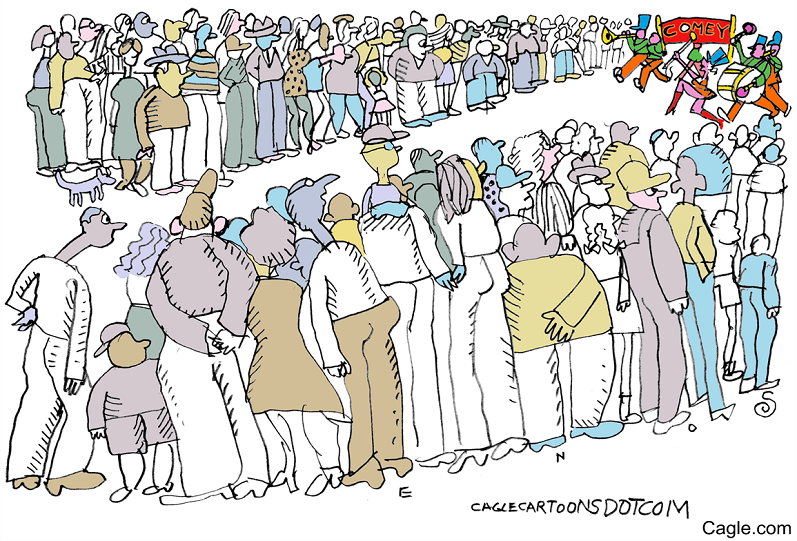 In the meantime the cartoonists carry on and the whole circus looks silly. At a time when both the left and CNN needed a win to regain some credibility they swung and they missed. Did some things come about about Trump he would have preferred did not? Absolutely. Was it a total victory for him as he is claiming – no. But it is more egg on the face of the left and their activist media. It is more proof for the members of the public that don’t trust or like the media these days. It was a flop. When will the media stop this nonsense? They are supposed to report the news not constantly be the news. And they are supposed to report the facts. Wouldn’t you like to see that happen? Sadly although the Comey circus seems to be over there is little doubt that a new circus is being prepared. There always is.